And enjoy the following band photo, courtesy of Alison Wonderland. Happy holidays from Tender Trap! 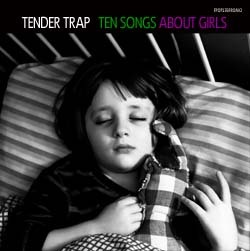 Our latest album “Ten Songs About Girls” is currently available on Fortuna Pop! You can watch the video for "Step One" here. It was mostly filmed at the Indietracks festival and features owls! To mark the album release, ClashMusic has posted a list of our top ten songs about girls (by other bands). See what you think of our picks. For press copies of the Tender Trap album, or for press contacts generally, contact Lucy Hurst at lucy@butilikeyou.co.uk. Come and see Tender Trap play new songs from the album (plus a few older ones) at the following show. Tues Jan 8 LONDON, Lexington, at the 3rd Annual Fortuna Pop! Winter Sprinter, with Allo Darlin and Spook Schoo (with DJing by Scared To Dance). Tickets £10.50 (or £32.50 for 4 day pass) http://www.wegottickets.com/f/5197. 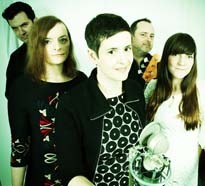 Tender Trap is Katrina Dixon, Rob Pursey, Emily Bennett, Amelia Fletcher, and John Stanley (aka DJ Downfall). Between us we have played in Heavenly, Betty and the Werewolves, Policecat, Talulah Gosh, Sportique, Dweeb, Marine Research, Sally Skull, and probably some more we have forgotten. We play indie pop-punk songs, with a feminist edge, fuzzy guitars, and bucketfuls of glorious girl harmonies. To join our (infrequent) mailing list, email tendertrapband@gmail.com.